I slowly finished my first vector series. It just took me 143 day to made another xxxHOLiC vector. To be honest xxxHOLiC is just a pain in my a**. I am really disappointed about the latest chapters. In the beginning I really loved xxxHOLiC but right now its just boring. Hope the end of the manga will be awesome. The biggest problem I had was the background. I had so many ideas and none of them worked like I wanted. So I put Mokona underwater and well it worked, at least for me XD Added a raindrop twirl and lots of glitter XD.. Don't ask me why. it just popped into my head. Because the wallpaper looked still empty I decided to add something. I thought about adding petals but well, In didn't liked the idea, because almost everyone add petals.. So I searched for something else. Found some nice feather when I read a Tsubasa Chronicle Chapter. So I vectored/painted two feathers from THIS SCAN. I just rezised and rotate them to look different. I know that feathers aren't floating under water but I like the result and I hope you will like it too. xxxHOLiC Vector Series: No. 1, No. 2, No. 3, No. 4, No. 5, No. 6, No. 7, No. 8, No. 9 and No. 10! OMG! It's very nice work! Wonderful effects and beautiful design! You made it very well! Great job! Aw, this is so cute. I love the feathers. needed. Actually to me it would be better without the sparkles. Very nice and strange but its ideal for the desktop as it leaves a bit of space for icons too. Well done! mOKONA !THE WALL IS CUTE!I THE ROSSE ARE A GOOD IDEA! I love the flowers and the feathers. The only thing I would say is the circle above Mokona`s head isn`t needed. Other than that, everything is perfect. The color is really match and it's really really awesome! MOKONA ! XXXHOLIC FOR THE WIN ! Wow! It is different than your usual, and I like it! The deep blue of the water is lovely~ As is the sparkly ripple effect. And great vectoring. Nicely done! very cute. i like your wall a lot! The full-view is great! I really like the fact that there's only Mokona~ It really made Mokona stand out. 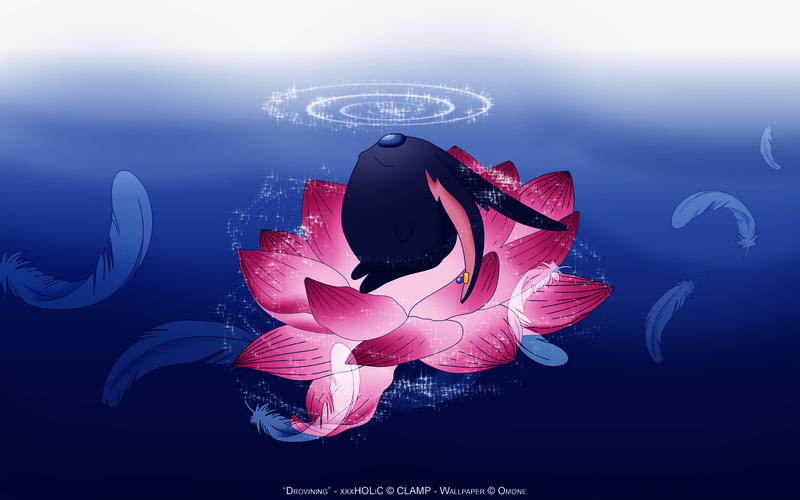 Lovely cute Mokona, I like bg. Thanks for uploading, it's an awesome vector. sooooooooooo cute XD thank you so much for sharing! cute cute mokona~ thanks for sharing., ?